Duck rice and laksa with the family for lunch. As a student I would have never gone to hawker centres if I was eating out with friends. Nowadays I love meeting up with friends at hawker centres. The atmosphere, variety of food, good food (I actually think Malaysia does it better but hey we’re in Singapore so let’s make do) and wallet-friendliness – there’s no where else I rather be on a weekend night out. Nothing can beat the Singapore breakfast. 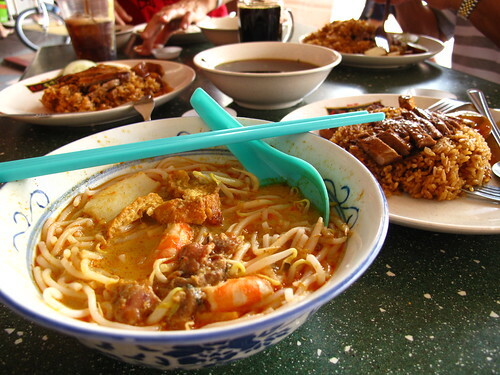 Mee rebus and wanton mee at Blk 58 New Upper Changi Road hawker centre with the family. We used to live in the neighborhood so this was where I hung out when I was growing up. 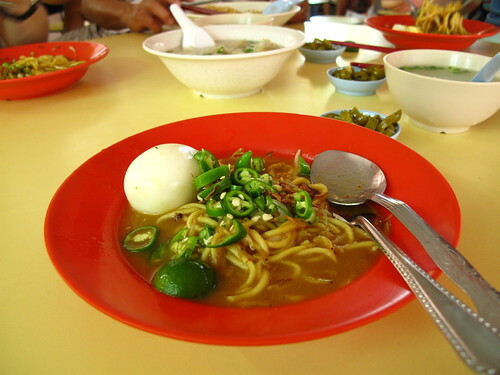 The mee rebus is still cooked by the same Makcik who took my orders more than 20 years ago. 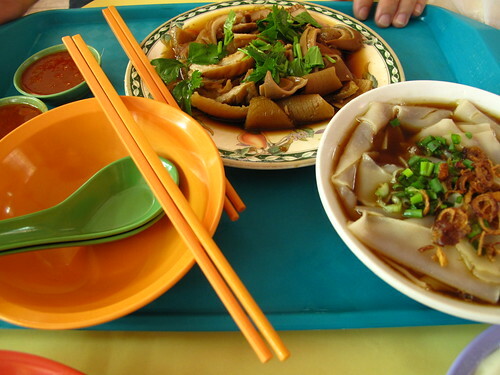 And of course, some kuay chap (flat, broad rice noodles eaten with braised pig offal, pork, beancurd, eggs and a spicy tangy chilli sauce) and tau huay (a snippet of the purple bowl in the corner of the picture) to complete the breakfast. Hooray for hawker centres ! Hmmmm! Your blog… or you always make me hungry!!! Heh ! I feel hungry now looking at the pictures myself. Craving for more food from Singapore.